Peace is indeed the number one ideal embraced by alternative believers. It is an ideal supported by both the mentally and emotionally polarized, by the sixth ray people going out of influence and the seventh ray coming in. The main difference between the two is in the approach, not the desired end result of peace and goodwill. In addition to peace there are a number of other ideals that are too firmly embraced with the sixth ray attitude of a black and white approach leading to extremism. What is overlooked is every virtue must be applied with good judgment else it will turn into a vice. For instance, we all realize that generosity is a good quality, but if a parent gives away all the family’s grocery money to a good cause he will be doing harm to his children who may go hungry. Good sense is always the bottom line for anyone seeking to become a master of wisdom. So let us look at some other ideals endorsed by those in alternative spirituality. Inclusiveness would be high on the list. 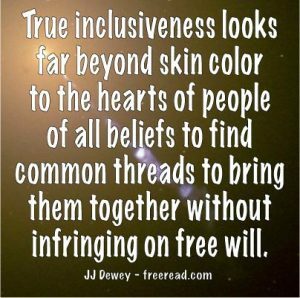 They teach that a lack of inclusiveness pervades Christianity for many believe that only members of their church or belief system will be saved and some are accused of favoring the rich or a certain class of people. Most alternative folks feel they are free from this fault and see themselves as having a loving open door welcoming all into the fold. Many have also stepped into the political arena and have advocated welcoming all across the borders, legal or not. Many want no screening process at all to filter out criminals. Indeed it is a virtue to be inclusive if applied with common sense, but like all virtues, if taken to the extreme, it becomes negative rather than positive. We see this working out with the borders of the United States. Because of the great inequality of the people south of our border we have the problem of millions crossing the border illegally. On the other hand, because there are fairly comparable standards of living between Canada and the USA we do not have the same problem with them. We can be as inclusive as we want with Canadians with no negative results. The solution with Mexico is to assist them in obtaining an efficient government and productive society so their standard of living will increase. When Mexicans can earn as much in Mexico as they do in the United States then the problem will be solved and open borders will be no problem. In that case we would probably have as many U.S. citizens going south as Mexicans coming north. The key to wisdom here is that as much as we want to be inclusive, generous and helpful all must be done with the application of thought. Without this the person may wind up doing more harm than good. If we do more harm than good, even with good intentions, we will create negative karma. Jesus was an inclusive guy, but even he acknowledged limits in his parable of the wise virgins. The five wise virgins saved up oil for their lamps so they could have sufficient to meet the bridegroom. The five foolish did not. When the call came the five wise lighted their lamps and proceeded, and the five foolish asked to borrow some of their oil. They replied that if they shared then none of them would have enough for the journey to meet the bridegroom. They thus refused and went on their way. The five wise virgins had the choice which was this. Was it better that five achieve success or none succeed? They wisely held to the idea that it was better that five succeed than none. Even so, if our country shares too much and is too inclusive we face the danger that Billy Bob did with his house. Everyone could loose. The strong can help the weak, but if the strong become weak then there will be no one to help. At present, instead of violating the principle of the incoming seventh ray with lawlessness, we need to go by the laws that are on the books and if they are seen to be unjust we need to change them. 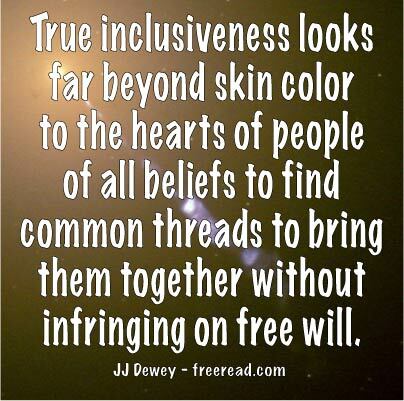 Inclusiveness and lawlessness are a dangerous mixture.